Legacy analysis pass which computes BlockFrequencyInfo. Definition at line 134 of file BlockFrequencyInfo.h. Definition at line 297 of file BlockFrequencyInfo.cpp. 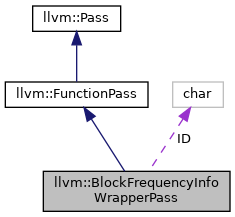 References llvm::PassRegistry::getPassRegistry(), llvm::initializeBlockFrequencyInfoWrapperPassPass(), and ~BlockFrequencyInfoWrapperPass(). 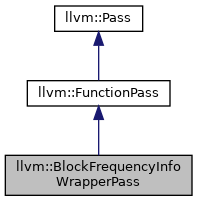 Definition at line 309 of file BlockFrequencyInfo.cpp. Definition at line 143 of file BlockFrequencyInfo.h. Definition at line 144 of file BlockFrequencyInfo.h. References F(), llvm::BlockFrequencyInfo::print(), llvm::BlockFrequencyInfo::releaseMemory(), and runOnFunction(). Definition at line 304 of file BlockFrequencyInfo.cpp. Definition at line 315 of file BlockFrequencyInfo.cpp. Definition at line 317 of file BlockFrequencyInfo.cpp. Definition at line 138 of file BlockFrequencyInfo.h.